POLYESTER BAR: EL miércoles del Orgullo inauguramos columna! EL miércoles del Orgullo inauguramos columna! Miércoles 1 de julio 21:00 horas. "Pictures:Tres" desnuda la personalidad artística de Dean Sameshima. El creador abre sus archivos, el material recopilado con el que ha trabajado durante todos estos años, para reubicarlo estéticamente y ofrecerlo bajo un nuevo prisma que sirve a la vez de resumen y de salto hacia adelante. Estas fotografías, textos y publicidades, mayoritariamente de los 70, aunque acarician referencialmente nuestros días, son sus fuentes: un cúmulo de iconos, ideas y fantasías entorno al deseo. No rechaza ni las referencias al arte, ni a la belleza, ni a la violencia, ni al crimen. La mayoría muestra hombres jóvenes y desnudos de belleza algo corrompida, viciados o imperfectos a ojos de la moral y la estética al uso. El conjunto ofrece una especie de mapa emocional de sueños y anhelos, con evidente posicionamiento socio-político cercano a los prolegómenos del movimiento Queer. Sameshima realiza lo que Barthes no dudaría en calificar de "terrorismo textual", y el resultado es un collage metagenérico en el que tienen cabida desde Genet hasta el Physique Pictorial, pasando por Mapplethorpe, Jeffrey Dahmer (el carnicero de Milwaukee), Fassbinder o Andrew Cunanan. Dean Sameshima (Torrance, California, 1971) estudió Bellas Artes en el California Institute of the Arts y se licenció en el Art Center College of Design de Pasadena. Pertenece a la nueva generación que está revolucionando la escena artística de la Costa Oeste americana. Expone regularmente desde 1995 y su obra ha podido verse en el Indianapolis Museum of Art, en la Kunstverein Hamburg, en la Tate Modern de Londres, en la Palazzina Reale de Florencia y en el MOCA de Los Angeles, donde forma parte de la colección. Vive y trabaja en Los Ángeles y Berlín. Está representado por las galerías Peres Projects (Los Ángeles, Berlín) y Taka Ishii (Tokyo). Esta es su primera exposición en España. Wednesday 1st April. 9:00 pm. "Pictures:Tres" unveils Sameshima´s artistic personality. He checks his own archives, several material compiled through the years that he usually uses in his work, to offer it in another aesthetic place under another lens, half a resume, half step ahead. This images, texts and advertisements, mostly from the 70s even they refers also to our days, are his true resources: a group of icons, ideas and fantasies around desire. He doesn´t reject art referencies, beauty, violence or crime. Some of them show young naked men, with a corrupted and imperfect beauty to the eyes of usual moral or beauty codes. The collection offers some sort of emotional map of dreams and wishes, with an evident socio-political position close to the extensions of the queer movement. 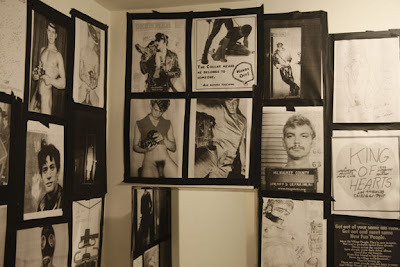 Sameshima makes what Barthes wouldn't doubt to call "textual terrorism", and the result is a metageneric collage able to include Genet and the Physique Pictorial, passing through Mapplethorpe, Jeffrey Dahmer (Milwaukee´s serial killer), Fassbinder or Andrew Cunanan. Dean Sameshima (Torrance, California 1971) studied Fine Arts at the California Institute of the Arts and got a degree by the Art Center College of Design of Pasadena. He belongs to the new generation that is revolving the artistical scene of the american West Coast. Since 1995 his work has been shown at the Indianapolis Museum of Art, the Kunstverein Hamburg, the Tate Modern in London, Firenze´s Palazzina Reale and Los Angeles MOCA where he is part of the colecction. He lives and works in Los Angeles and Berlin. He is been represented by Peres Projects Gallery (Los Angeles, Berlin) and Taka Ishii Gallery (Tokyo). This is his first show in Spain.